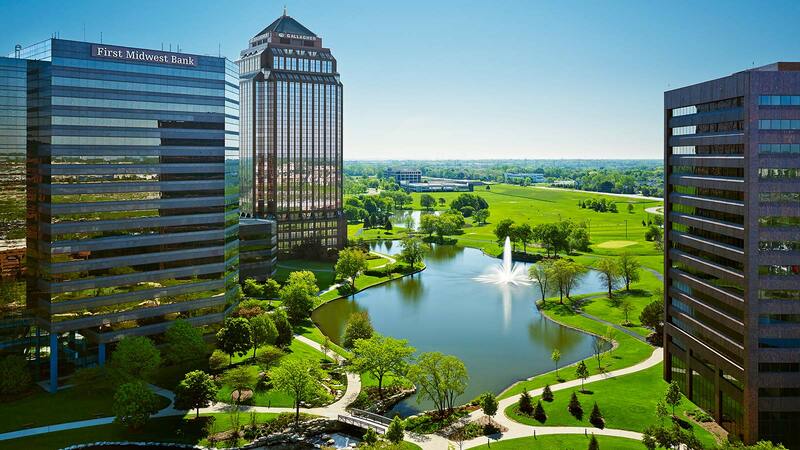 SMALL BITE: Shula’s America’s Steak House is kind of hidden inside The Westin Chicago Northwest in Itasca, Illinois. 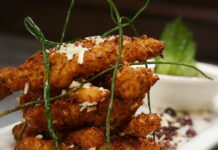 The restaurant is the brainchild of Don Shula, the legendary head coach of the Miami Dolphins from 1970-1995, and his son, Dave Shula, a former NFL player and coach, as well. Some of the best steaks around! SIGNATURE DISHES: For starters, try the French Onion Soup. Hands down (or touchdown? ), one of the best soups ever. Can you say, “Flavor explosion!”? 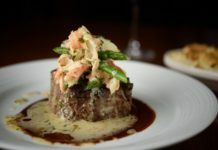 You can’t eat at Shula’s without trying a steak, and there are ample choices. Be sure to order at least one of the trademarked “Shula Cut” steaks, ranging in size from 8 oz. to 48 oz. Plenty of seafood options, too, such as Pan-Seared Sea Scallops and Twin Lobster Tails. Side dishes cost extra, but definitely worth the investment. Creamed Spinach, Crab Mac & Cheese and Potato Gratin are a few tasty options. 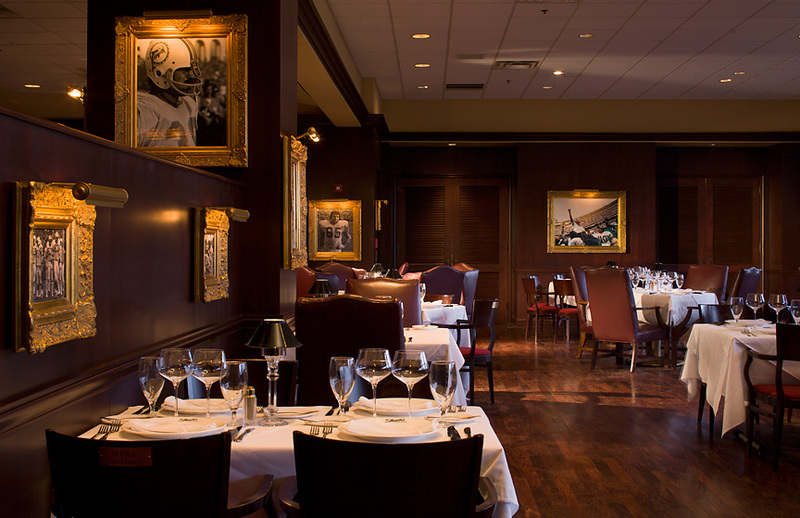 FOOD FOR THOUGHT: All Shula’s Steak House locations will be honored for the fourth consecutive year by Wine Spectator Magazine with their 2015 Award of Excellence. The SHULA CUT sits on top of the beef quality pyramid and less than 1 percent of all beef makes the SHULA CUT; taking only the most desired Custom Center Cuts of the Premium Black Angus Beef brand, making the SHULA CUT the best beef money can buy. Shula’s partners have been in the cattle business since the 1930s. ANOTHER FUN FACT: When the host/hostess seats you, he/she will carry an autographed teal and orange football (Dolphins’ colors!) to your table. You may be tempted to stuff it into your purse and sell it on eBay later, but resist the urge. That would be theft. Besides, when the server comes to take your order, he/she confiscates the valuable would-be souvenir anyway. HOURS: Breakfast: Seven days a week, 6:30 a.m. – 11:00 a.m. 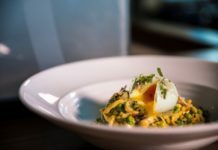 Lunch: Seven days a week, 11:00 a.m. – 2:00 p.m.
Dinner: Every night, 4:30 p.m. – 9:00 p.m.
Brunch: Sunday, 11:00 a.m. – 2:00 p.m.
ABOUT THE WESTIN CHICAGO NORTHWEST: Pet lovers will be happy to know this Westin is a pet-friendly hotel! 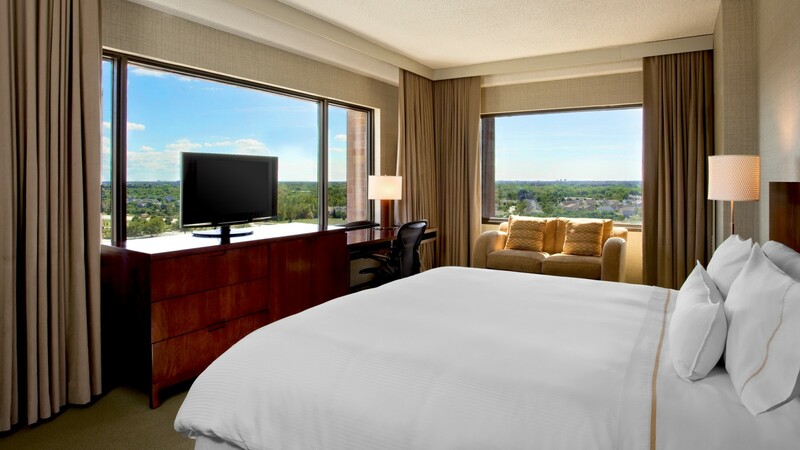 Located just 13 miles from O’Hare International Airport and 27 miles from downtown Chicago, this four-star, four-diamond hotel is situated in the Chancellory Business Park and three miles from the Schaumburg/Woodfield business district, convenient to such companies as Arthur J. Gallagher, Sun Microsystems, Hitachi, and NEC Display Solutions. It features a workout studio, The Westin Kids Club, free Internet and the Westin Well-Being Movement, a global initiative dedicated to inspiring our guests to discover new approaches to well-being at Westin and beyond. The Movement will feature innovative partnerships and programs across Westin’s six pillars of well-being: Sleep Well, Eat Well, Move Well, Feel Well, Work Well and Play Well.